However, along with the innovation came a somewhat questionable practice. If a fuse blew, it was normally replaced immediately (often without tracking down the source of the fault). But, if it was the last one the homeowner had and the hardware store was closed or a long distance away, a penny (at the time made of pure copper) was placed behind the spent fuse to complete the circuit. The intention was to replace the penny with a real fuse at the first opportune moment. Yeah... that was the intention. But often, that didn't happen. And houses still burned down. That was then. But now most circuit panels are relatively homeowner-proof, with circuit breakers replacing screw-in and cartridge fuses. But even in today's electrical world, fuses still play an important part in circuit protection. A very critical part, in fact. And they're not always just a simple fusible link. The old days were relatively simple days. Overcurrent and short-circuit protection were supplied for fairly basic conductors. Wires in the walls and attic; wound wire coils for motorized equipment like refrigerators, furnaces and hair dryers; and of course, conductors that produced heat to generate light in lamps: filaments. It's a little more complicated nowadays. No... make that a LOT more complicated. With all the innovation in electronics and other control systems, fuses must be precisely engineered for the specific application. It's no longer a one-fuse-fits-all scenario. However, there's a type of Class RK1 fuse that can simplify equipment upgrades. A reduced current rating fuse is available that is designed to fit into the next size fuse holder. It provides the same protection as standard RK1 fuses. However, it's designed to allow for ramped up power demand, without changing out the fuse panel. While researching for this article, I was amazed to find out about the multitude of applications for fuses and the engineering differences involved. For example, did you know that there are fuses designed specifically for photovoltaic applications? Yep, that rooftop sun-into-power unit on your house, business, or factory demands a fuse that's designed for that use. With the complex electronic systems in use, fuse engineering is even more critical. And there are fuses for both AC and DC applications, at a wide range of voltages and amperages and noise. The modern day equivalent to the old penny-behind-the-fuse trick is snapping in the wrong type or value of fuse when the correct one is unavailable. Yes... it happens. If it fits, it works! And production returns to "normal." Not good... not good at all. You might notice that some fuses have connections that won't work anywhere else but in the proper application. And now... you know why. It's also about worker safety. More and more emphasis is placed on arc flash danger, particularly from OSHA. Arc flash has always been there... we're just understanding its potential danger better these days. And thus, the speed of opening the circuit is vital for preventing potential flash (which, by the way, can be four times hotter than our good old sun. And you thought a sunburn hurt!). Finger-safe fuse holder protect workers' tools and fingers from coming into contact with live conductors. Far from just clips that secure fuses, entire fuse systems have evolved that do more than just protect conductors. 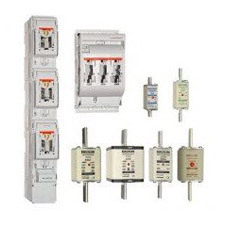 They reduce equipment downtime and protect electrical installations, people and business investments. All while being a vital link to improving electrical performance and reliability. Use the correct fuse system for each application. Always.